Happy 4th of July! Today is a day to celebrate the independence of our great nation, be with family and friends and hopefully enjoy a summer picnic. 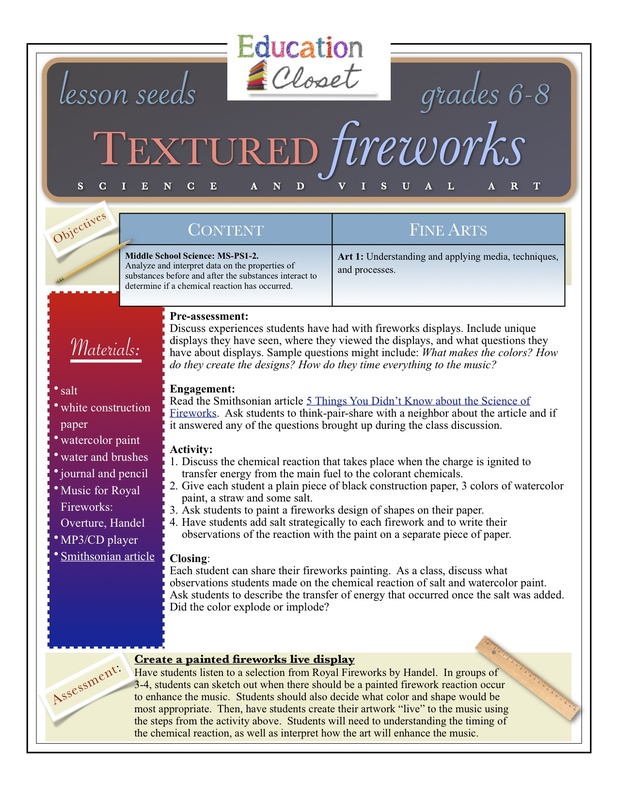 To help share in the festivities, we are offering a free Arts Integration lesson plan today that is all about the textured fireworks displays that we love this time of year. There is so much beauty in these amazing groups of sky art. Not to mention the art that it takes to time the chemical reactions just right so that the fireworks correlate to the music that is playing. Which is why this makes for a perfect Arts Integration lesson! This lesson seed combines grades 6-8 middle school next generation science standards for chemical reactions with visual arts media processes and musical expression. I’m particularly excited about the assessment of creating “live art” in time with the music using the chemical reaction between watercolors and salt. So fun! Happy fourth, everyone!